The B150-1A1-HDMI DisplayPort to HDMI over Cat5/Cat6 Active Extender Kit includes a transmitter unit and a receiver unit that work in tandem to convert a DisplayPort audio/video signal to HDMI and then extend it to a projector, monitor or television up to 45 m away. The kit is ideal for digital signs, trade shows, presentations, classrooms, churches, retail settings and other applications where the video source is located farther than convention cables allow. One Cat5e/6 cable connects the transmitter and receiver (for best results, use 24 AWG solid-wire Cat5e/6 cable, such as Tripp Liteâ€™s N202-Series). A built-in DisplayPort cable connects the transmitter to the source, while a built-in HDMI cable connects the receiver to the display. Included USB Micro-B cables connect the transmitter to a USB port on the DisplayPort computer or a USB wall charger (such as Tripp Liteâ€™s U280-002-W12), and connect the receiver to a USB port on the HDMI display or a USB wall charger. No external power supplies are needed. The B150-1A1-HDMI can extend a high-definition 1080i (60 Hz) signal up to 150 feet and a 1080p (60 Hz) signal up to 38 m. In addition to crystal-clear video, including 24-bit True Color (8 bits per channel), the kit delivers full, rich stereo. Green and orange LEDs on both units indicate when they are receiving power from the USB Micro-B cables and sharing a signal. Easy to set up with no software or drivers to install. Works with all operating systems. 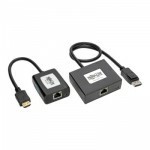 * DisplayPort source must be enabled to support audio in order for kit to extend audio signals"